Replacing your Access Apps (SharePoint Access Services) with skybow. Business solutions are one of the major use cases for SharePoint. We all know this “Get me the leave-request solution in SharePoint” requirement, and, it was a valid requirement from the day one. SharePoint is, after all, a very good collection of data artifacts and building blocks. Yet, building such a solution in SharePoint was not, and still is not, an easy task. For one, because leave-request process is just enough different in every company, so that making a shelved solution is impossible, and for two, because building solutions on top of SharePoint was always something done by developers, and was considered as a standard development discipline. Microsoft has, mainly successfully, tried to approach this issue with InfoPath and workflows, tools for developing forms and business logic on top of SharePoint. Even with lot of limitations it has mostly fit the purpose. At least until SharePoint Server 2010, and especially SharePoint Server 2013 times. Since SharePoint 2010, we have been witnessing introduction of SharePoint Access Services, and Access Apps (SP 2013), as a tool for building business solutions on top of SharePoint. This was a legitimate attempt from Microsoft, since it was already clear that InfoPath’s life-cycle is coming to its end, and business solutions on top of SharePoint is still one of the major scenarios in the use of SharePoint. Anyway - Access was, from the day one, a success-story for citizen developers and business solutions on Microsoft Windows, so why not give it a try in SharePoint? Well, because SharePoint is somewhat different, and it has always had its own rules, customs and traditions. Access Services in SharePoint are not really SharePoint. Data in Access Services is stored in a separate SQL database, and that – besides some obvious advantages – also brought a lot of issues, especially for the users who are used to the SharePoint way of things. No workflows. No permissions management. No integration with the rest of the SharePoint platform (search, content roll-up, etc). Furthermore, lot of standard Access functionality was not present in the Access Services, so users had to power-up the Access Client to get those features (running reports being the most prominent one, and even that is not possible for the Store-enabled Access Apps). All that has influenced that the adoption of Access Services and Access Apps in SharePoint never really takes off. Access Services and Access apps have always been a niche in SharePoint. What we notice in the recent time, is less and less talk about Access Services from Microsoft’s side, so it is a fairly safe bet, that Microsoft will not be investing that much in Access Services and Access Apps in the near future. Furthermore, on March 27th, Microsoft has announced that they will be removing Access Services and Access Apps from Office 365 – SharePoint Online offering by April 2018. 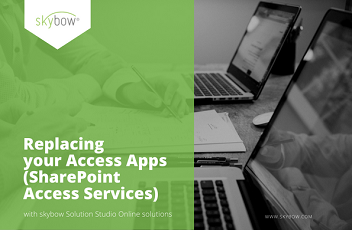 If you have already set on Access Services, and build your solutions there, here we are going to talk about possible way out of that situation: using skybow Solution Studio Online solutions to replace the old Access Apps. 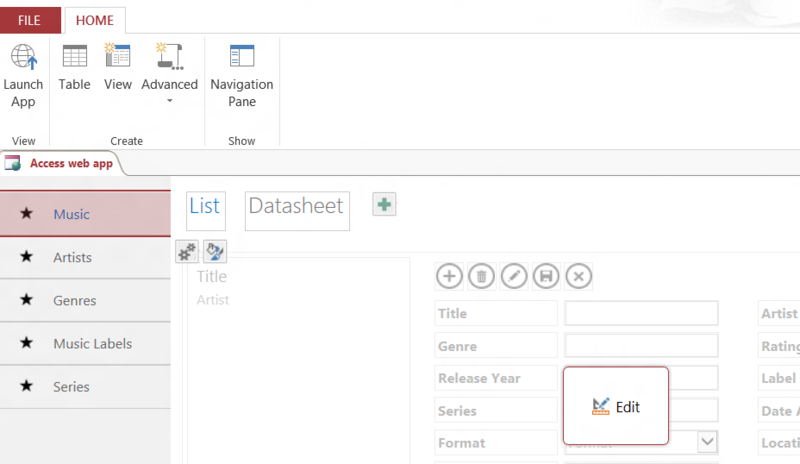 What is skybow Solution Studio Online? skybow Solution Studio Online is the abstraction layer between SharePoint platform components (web parts, application pages, lists, items) and the business solutions that enterprises need. It is a clockwork of different internal mechanisms, which is helping enterprises to create structured data, processes on that data, and visualization (UI) and reporting on that data, with as little coding as possible. It is fair to say that skybow Solution Studio Online is an environment for rapid creation of business solutions on top of Office 365 - SharePoint Online (as of now), and very soon SharePoint Server 2013 and 2016 (on premises). Using skybow Solution Studio Online, developing solutions like “Request for Leave” becomes a straight-forward process which can be implemented by functional consultants, without (or at least with very reduced) involvement of developers. This drastically decreases time needed for development of such the solutions (up to 85%). In the next few chapters, we will give you a high-level overview of example “Request for Leave” solution development, and how it can be easily built with skybow Solution Studio online, instead of Access Services. Why is skybow Solution Studio Online the right way out of Access Services pitfall? As such, this data is accessible and interoperable with all other SharePoint Services, including search, content aggregation and roll-up, etc. 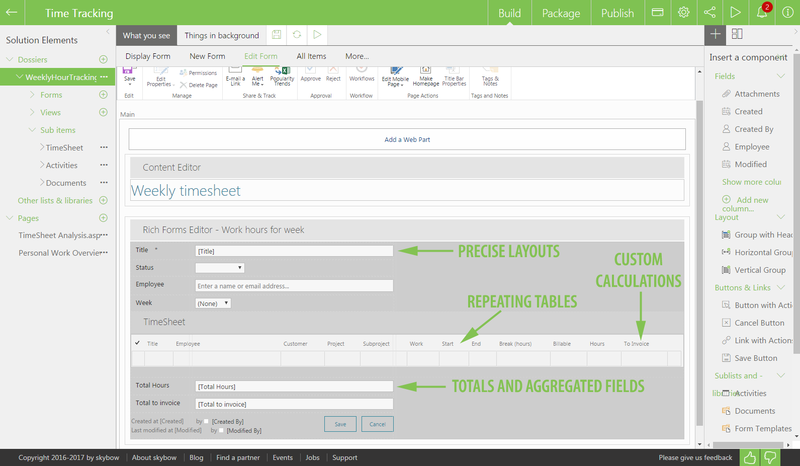 Background processing through skybow Solution Studio aggregations, metadata inheritance, and scheduled and conditional actions. Fully aligned with SharePoint security and permissions, including groups, and list-level and item-level permissions. Let us take a short look at the process of changing Access Apps with skybow Solution Studio solutions, and what is the best way to proceed. You want to know how this story goes on? Download the ebook and take a deep dive!